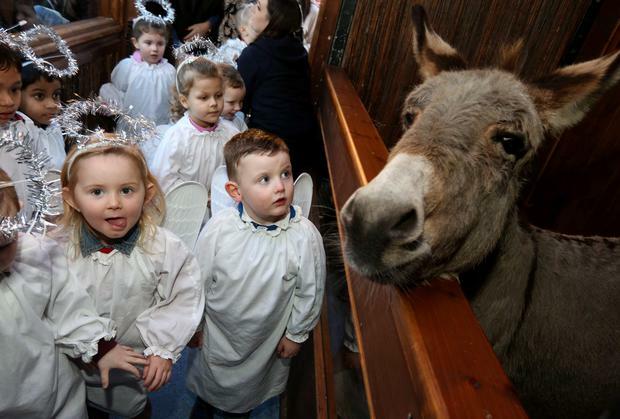 Four year old Riley Byrne from St Josephs Dublin 8 gets to meet the donkey, at the opening of the IFA live animal crib at the Mansion house in Dublin. Oh, the weather outside is frightful… And you could stay indoors, gather the family around the box and crack open a tin of Quality Street. Or, you could grab your coat, shut the door behind you and embark on a proper Christmas adventure in the city. Our favourite animatronic figures are out of their boxes, and it’s time to show the little ones how things used to be done. Yep, the Moving Crib at St Martin Apostolate’s, 42 Parnell Square, has been around for more than half a century. Basically, it’s a nativity play featuring more than 100, handcrafted figurines “depicting biblical life”, lots of pretty, hand-painted backdrops and sets, and a few wild animals (they’re not real, obviously). All the lads are in there, from Joseph and Mary to the three wise blokes. The scenes are set and the figures are moving as we speak — you know what to do. Things might get noisy out at the RDS, but Ballsbridge just wouldn’t be the same without Funderland in December (we’re not sure when they added the ‘winter’ bit). “Ireland’s largest Christmas theme park” is officially open for business, with some new attractions lined up for us, including the ‘Funderland Loop’ (it’s a rollercoaster, basically). But, there’s more! Fossett’s Christmas Circus is also part of the mix, and they’ve even installed an outdoor ice rink (called ‘iSkate-on-Ice’). And did we mention the Christmas market? Have fun — just be careful on the ice, though, you hear? Christmas carols, a candlelit setting, a great, big, fancy hall — all the boxes are checked, but we’re forgetting one thing: this year’s Carols by Candlelight event at the NCH features the Mozart Festival Chorus and Orchestra “in full period costume”. Yep, everyone will be making like it’s the 18th century for an elegant display of classic, seasonal tunes. Imagine that. suggest you keep an eye on Twitter and head down Grafton Street on Thursday afternoon. Why? 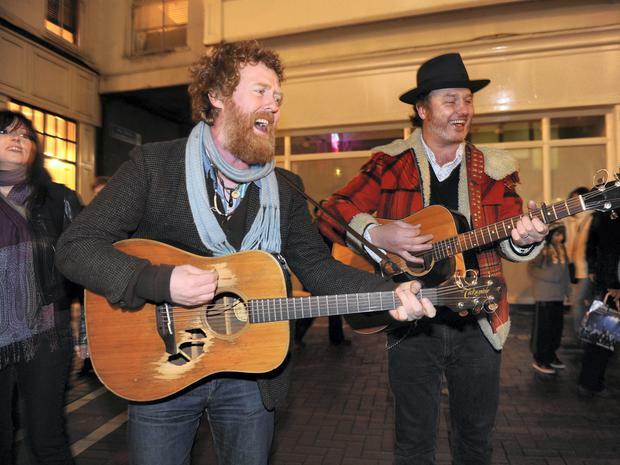 Because Bono might be there — he and Glen Hansard usually swing by for a Christmas Eve busking session in aid of the Dublin Simon Community. We wouldn’t be surprised if Glen brings a few famous buddies (my money is on The Coronas). We’ll leave the pub up to you, but there is no better feeling in the world than strolling into your local on the 24th, shopping bags in hand, and pulling up a stool with friends and ordering a cold one. Everywhere will be jammed, but you’re only staying for one (maybe three). Might we suggest The Long Hall on George’s Street or 57 The Headline on Clanbrassil Street? But, if you’re really looking to get into the spirit of things, drop the prezzies off somewhere safe and head to Grogan’s on South William Street or The Stag’s Head on Dame Court. Drink responsibly! You’ve opened the presents, tidied away Santa’s cookie crumbs and it’s not even 8am yet. What else is on the Christmas Day to-do list? 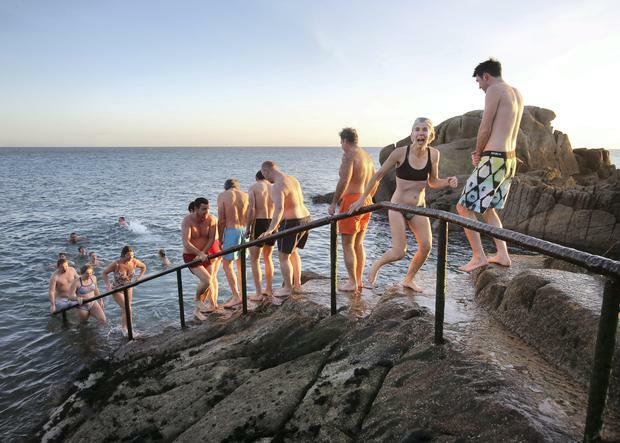 A festive dip in the Forty Foot in Sandycove — it’s the perfect excuse to work up an appetite, and if nothing else, you’ll have a smashing (read: freezing) time. Now this is the big one. A day at the races! Festival fun! Celebrities! Politicians! Gigantic hats! There are people out there who spend most of Christmas Day preparing for the annual Leopardstown Christmas Festival when, for four days straight, thousands of well-dressed folks get their bets on and head out into the open for the only horse-racing event in the world where it’s perfectly acceptable (and sort of cool) to wear Christmas baubles for earrings (this may or may not be true). This could very well be the most glamorous festive shindig of the year. So, it’s pantomime season out there (oh no, it’s not, etc, etc) and we’re spoilt for choice, so let’s break down the big ones. 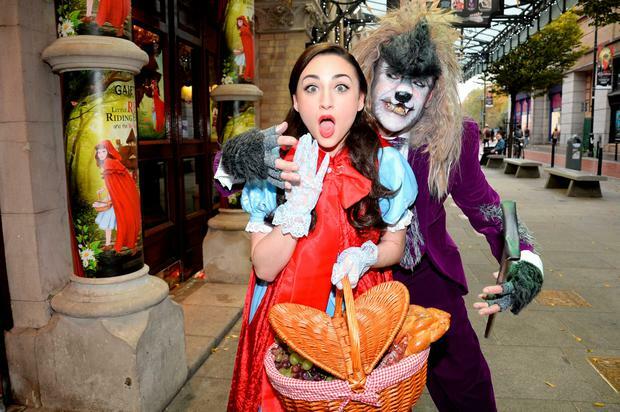 First up, Little Red Riding Hood and the Big Bad Wolf at the Gaiety Theatre has extended its run until January 24, so, you know: it must be good. Freezin’: The Story of the Snow Queen (we love that title), starring Al Porter, has just opened at the Olympia (ends January 10). We have Jack and the Beanstalk at The Helix until January 10 and, of course, there’s this year’s Cheerios Panto at the Tivoli, Beauty and the Beast (ends January 10), starring Alan Hughes as Sammy Sausages.